short girl, long island. : Giveaway, Day 14: The Sapphire Bee. CLOSED. Happy Friday, folks! I hope you got through the work week + plan on enjoying your weekend. We have another giveaway from The Sapphire Bee for you today. 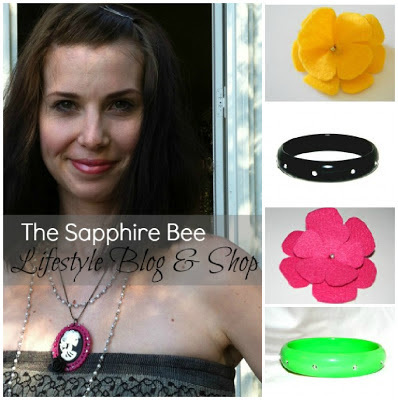 The prize up for grabs is one sparkling bangle of your choice, one flower hair clip of your choice + one month of medium ad space on The Sapphire Bee's Blog. There are still plenty of giveaways still up for grabs, so after you enter here, don't forget to catch up on the ones you have yet to enter. Good luck!